Come New Year's Day we're all determined to stick to our newly-made resolutions. Many of us enter the new year with a goal to better ourselves, whether it be the way we look, our inner selves or simply our lifestyle. This month we take a look at the best places to go for natural healing, inner wellness and cosmetic surgery - so that the new year can welcome a new you. The world is filled with mystique and legends. Stories of places that keep you young forever or transform you into a different being all together. These places, while shrouded in fairy tales, do actually exist. Well, sort of. Letâs brush away the wisps of myth and explore these locations and the truth behind them. While I canât promise you immortality, I can let you in on some of Mother Natureâs secrets to youth and wellness. Welcome to the earthâs lowest point below sea level, the Dead Sea. This salty location is 1,312 feet below sea level and is a place of natural healing. While the salt in the water is beneficial to the body, it is actually the dark mud composites that build up on the sea bed, which posses sought-after healing properties. The dark silt is enriched with many minerals - all of which improve your skin. The natural combination draws out toxins, while the sulphur softens your skin. Once the mud has dried to a clay, it will act as a natural exfoliant, removing dead skin, encouraging rapid cell re-growth and improving blood circulation with manganese oxides it contains. 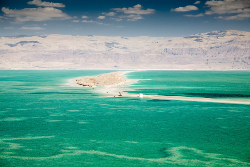 Visit Israel or Jordan to get to the Dead Sea. The drive is approximately 45 minutes from either, and is incredibly beautiful. If you choose to stay on the Israeli beaches then consider staying at the Yehelim Boutique Hotel. If you wish to stay on the Jordanian coast then consider staying at the Dead Sea Spa Hotel. Israel offers you the history of Jerusalem with its sweeping hills capture the eye on the West Bank, off the Dead Sea. An hourâs drive away, the Old City of Jerusalem is worth a visit for anyone who is seeking a spiritual encounter, religious or not. The Old City is also an ideal place to explore, for all those interested in history and architecture. Stay on the Jordanian banks of the Dead Sea and do some diving at Aqaba, with diveaqaba.com, a school situated on the Northeastern coast of Jordan and a three-hour drive from the Dead Sea. 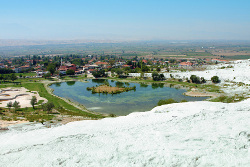 Pamukkale is known as The Cotton Castle of Turkey (itâs also its direct translation). The travertine slopes of Pamukkale are home to 17 natural hot water springs that flow into the natural pools of calcium carbonate. It is the combination of the calcium carbonate, minerals found in the water and the heat of it, that gives them their natural healing powers. It is said that visiting the pools could potentially ease symptoms, if not cure ailments such as Asthma and Rheumatoid Arthritis. Calcium salts in the water also help purify, as well as 'beautify' your skin. These healing powers were part of the reason that Romans built the so-called âSpa Cityâ of Hierapolis around these pools. For thousands of years, people have travelled here in hope of miracle cures and eternal youth. While I canât promise you either, the natural beauty of the travertine pools alone is worth a trip. Many hotels sprung up around the pools, some have caused damage to this natural wonder. They have since been torn down in order to prevent any more damage to the natural landscape. If you want to spend some time exploring the town, consider one of the smaller hotels, such as the Artemis Yoruk Hotel. As beautiful and refreshing as the pools are, donât forget to explore the rest of the area. The ruins of ancient Hierapolis are more than just a pile of rocks: a fair number of the structures are still intact, which give you a good idea of what the city must have looked like. Another trip worth making in the area is to the Karahayit Red Pools - while they may not have the healing powers that the clear hot springs, the colour makes them an extraordinary sight. 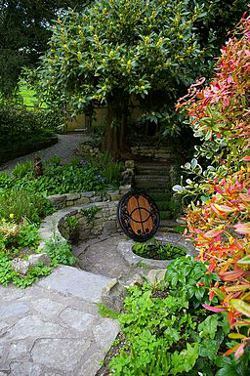 The location of the Chalice Well is steeped in mythical history. It is claimed that Glastonbury is the Vale of Avalon - a place of magic and legend. Druids of ancient times said the Ley Lines (geometric connecting lines) passed under the Chalice Well, essentially making it a font of eternal youth. The Chalice Well is also surrounded in religious legend. Joseph of Arimathea is said to have returned to the water with the "Cup of Christ" or "the Holy Grail" and washed it in the well or buried it nearby - thus giving it its power of immortality. 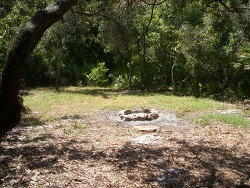 While many legends and myths make the well an intriguing place to visit, it is still believed to be a place of healing. Many visit the Chalice Well to drink from the naturally iron-enriched spring, which is still believed to have healing benefits. The surrounding gardens are enchanting and peaceful. Even if the water from the well is unable to soothe your ailments, the garden itself may be able to help - at least with the metaphysical. If you find yourself craving more mystical adventure, visit the Fairy King at Glastonbury Tor, often referred to by the locals as "the strange hill". Strange it is indeed, as people are often seen huffing and puffing their way to the peak and then practically floating down the hill on a cloud of happiness. This is put down to the fact that many fairies still inhabit this place of mystical wonder - ensuring all who visit with goodwill, will leave feeling blessed. The three peaks of Mount Sanqingshan are just visible above the misty tendrils that swirl around their crests. The mountain was considered a divine place by the Taoist of the Tang Dynasty (618 - 907 AD). 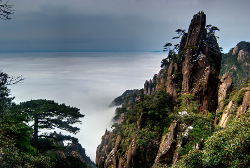 They believed that the three peaks of Mount Sanqingshan - Yu Jing, Yu Xu, Yuhua - embodied the three Divine Teachers: the Jade Pure One, the Supreme Pure One, and the Grand Pure One. With the Taoist philosophy of âthe Taoist way is to follow natureâ, you can understand why this place is of such great importance and thought to have the powers of immortality. Legend has it that Taoist Master Ge Hong (284 - 364 AD) was able to create pills of immortality in the mountains. While these pills have never been discovered, the mountains themselves seem to possess the power to heal. There is an ethereal power that runs through them that soothes the mind and soul, leaving those who visit with a more centred chi and allows for the body to more readily heal itself, both mentally and physically. The mountain was given World Heritage Site status in 2008, making it the 32nd Natural World Heritage Site. With over 250 ancient plants species along with many natural and made-made rock formations, it is worth exploring this gem, whether or not you discover the secret to immortality here. If you plan to hike the mountains, you will need to stay in the area for at least a few days. If hiking is not your thing, you can always take the cable cars linking the peaks. 40-minute rides give you 360-degree views of the mountains. This 12-foot triangular rock found in Osage County was believed to have mystical healing powers by the Native American Osage and Quapaw people. They would travel for miles to lay their sick and dying against the rock, which they believed would heal them. No matter how big or small the ailment was, it is said that the rock could save anyone. There has been much discussion among archaeologists and geologists about whether or not the rock was natural or man-made. However, close study of the rock proved that it was shaped through natural erosion making it a natural anomaly. The healing powers of the then called Teepee Healing Rock are, as yet, unproven even though visitors to the rock claim that their minor ailments no longer bother them after the trip. The Healing Rock was moved in 1985 when Lake Skiatook was planned as it was clear that it would become submerged. The Corps of Engineers moved it an eighth of a mile away. It is now accessible from the Corps office, via a trail. 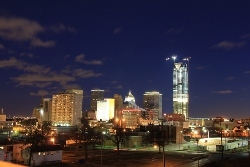 While you are in the area, visit Skiatook Lake. Fishing and boating are popular activities and there is also plenty of space for family recreation and camping. Alternatively, for a more luxurious experience, stay at The Mayo Hotel in Tulsa. A short 20-minute drive away, its known just as much for its modern comforts as its rich history. Thereâs nothing like a new year to inspire you to be a new you or to become a better version of yourself. While society tends to put pressure on what you look like on the outside, don't people always say itâs whatâs on the inside that counts? Well, I believe that if youâre healthy and at peace on the inside, it will reflect outwards. Working on your inner wellness might just be the break your body needs - from meditation and yoga to pure relaxation - I have chosen the best places to reflect on your inner wellness, and be the best person you can be for the year ahead. Bring some serenity to your life, the Temple Mound Spiritual Wellness Center is a place worth paying a visit to. Situated in the tranquil city of Tarpon Springs, Frorida, this centre is very popular with people in search of inner peace. The centre is located around an Indian Temple Mound, which dates all the way back to the period of the Great Pyramids. The facility includes accommodation, meditation rooms, a reading room and a library, as well as tranquil space in a beautiful forest. If you donât feel like going on this retreat alone, Temple Mound also offers their facilities to groups. And the activities are somewhat expansive - meditation, yoga, acupuncture, massages and energy healing. After a day of meditating and yoga (it can be surprisingly draining), guests can take a book from the library and sit by the cosy fireplace in the reading room. But if you think youâre going to be sitting back watching some telly in the evening, think again - there is no television at the retreat as it causes too much distraction. While all the meditation and yoga is great for you, Temple Mound also makes sure that you eat well - all meals are made from fresh ingredients and are undeniably good for you. Now for the best features of this wellness centre: the actual Temple Mound and the Meditation Trail. As mentioned, the Temple Mound is prehistoric, which already makes it pretty special. However, it has also been said to have inner-healing powers. Many visitors have said they've had insightful and spiritual dreams in the days after visiting the mound. 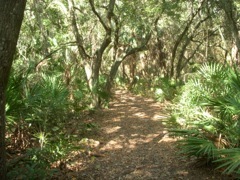 To experience raw, natural beauty, walk the Meditation Trail in the Florida Live Oak Forest. The lush forest is filled with winding paths that loop around the centre. If youâre going to be in Tarpon Springs for longer, stay at the Bavarian Lodge Bed and Breakfast. Located just a few blocks from Tarponâs tranquil bayou, this lodge offers great accommodation at good prices. They are also close to lovely bike trails and less than a mile away from the cityâs famous sponge docks. While in the city, take a walk along the winding roads from the bayou, which also happen to be filled with enticing shops. With a philosophy of âwellness starts from withinâ, you know that Chill Out Retreats is the right place to go to for inner wellness. In West Sussexâs lush countryside, be prepared for the ultimate getaway to revitalise yourself from the inside out. Here you get to indulge in some luxury while restoring your energy and completely detoxing. The retreat in West Sussex is run by Natalie, who aims to get visitors to connect with their mind and spirit. Besides enjoying some five-star accommodation, youâll also get to relax in the indoor heated pool and jacuzzi, go on long walks and have healthy, filling meals. At Chill Out Retreats, you really can do as you please as thereâs no strict schedule to stick to. During your days here, you can refresh your body with some intense sessions of yoga and pilates, or rejuvenate your mind with meditation. If you are attending the retreat between the months of April and October, you wonât want to miss a visit to the majestic Arundel Castle - it's just five minutes away from the retreat. It was built at the end of the 11th century and was once the home of the Duke and Duchess of Norfolk. Now open to the public or has been for the last 200 years. Walk around the relaxing castle gardens or experience the live operas and Shakespearean theatre often held at the castle. Tuscany is no doubt a beautiful, tranquil region of Italy - what with its wine routes and famous Tuscan sunset. And at Inner Being Retreats you can work on unwinding and rejuvenating your body, mind and soul. The retreats are one week long and can be booked for groups of six to ten people. Susana Hayman-Chaffey leads and teaches these retreats so that visitors get the authentic Italian experience, while learning how to connect with their inner selves. Her book, Love, Please: A Memoir of Destiny, Loss and Healing will be released in March 2013, so you know youâre in the hands of a pro at this retreat. Inner Being Retreats aims to get people to practice meditation and breathing techniques, which are important for an energised and healthy mind. The body is also enriched as all meals are traditionally Italian and made from the freshest fruits, vegetables, fish and meat. As stress is slowly becoming a part of many peopleâs everyday life, you will immediately feel yourself de-stress during this week-long retreat. Even usual daily stresses such as traffic and finding parking dissipate as you are chauffeured around wherever you go. A typical day includes waking up at 6am and going for a leisurely walk in the countryside while breathing in the fresh, Tuscan air. A healthy breakfast is served afterwards, followed by some training with Susana, where you learn the various techniques of meditation and breathing for inner wellness. To add to your genuine Italian experience, you can take a siesta in the afternoon. Get ready to do some exploring once you wake up from your nap. Visitors can go on daily outings for sightseeing and to soak up the rich culture in the little villages and markets of Tuscany. Your day ends with a filling, healthy dinner around the table for some good socialising, followed by some dancing if you feel like it. Inner Being Retreats fills up fast, so make sure to make your booking as soon as possible. The 2013 dates are: 16 - 23 June, 21 - 28 July, and 1 - 8 September. While visiting Tuscany, I recommend you go on one of the many day tours offered by Tours of Tuscany, where you will be taken around the breathtaking regions on a guided tour. Experience a day in Chianti, famous for its wine farms; or how about spending a day admiring the beauty of the art and culture in Florence? 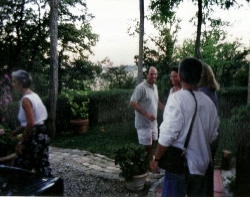 There is even a fantastic tour offering you the ultimate Tuscan cooking experience. Kerala is India's own province of paradise, which makes attending a course at a local ashram even more special. Millions of people around the world are on a quest to find ways to achieve and maintain excellent health, and a course at the Sivananda Neyyar Dam Ashram is definitely one way to balance out your inner wellness. The ashram itself covers 12 acres of tropical magnificence, being surrounded by forests of tall coconut trees. It offers many different approaches to getting in touch with your inner well-being, including the Ayurvedic Wellness Course. Ayurvedic means âScience of Lifeâ and the course approaches traditional Indian holistic techniques for achieving and keeping the health our lives so crave. It is two weeks long and sticks to a daily schedule. Besides the inner wellness and balance you will walk away with from this experience, youâll also have learnt a lot - visitors (or learners) are issued with a textbook, which they can take away with them for future reference. The next Ayurvedic Wellness Course takes place on 17 February 2013. During your two weeks at the ashram, youâll live on traditional Indian vegetarian meals and stay in dormitory-style accommodation (they also offer twin share rooms). Your daily activities vary, but they all strive towards the same goal: you gaining inner wellness. You will also get to go on a field trip which gives you the opportunity to explore the scenic surroundings. There is a lot of meditation and chanting (called Satsang), as well as the practice of Asana Yoga - the basic 12 positions of sun salutation. Another activity practised here is Karma Yoga. Karma Yoga is the act of selfless service, such as something simple like making all guests feel like they are a part of the ashram. Best of all, once you have finished the course, you get a certificate as a reminder of you accomplishment. canoe rides and also learn how to cook traditional Indian dishes. Mexico might be seen as a party destination to many people, but itâs also a country filled with rich culture and history. At Rolling Meadows Yoga and Meditation Retreat, you get to experience inner wellness right in the pre-Columbian Maya walled city of Tulum. The next course takes place from the 2 - 9 March 2013. Rolling Meadows takes a maximum of 22 people and aims to get its visitors to reconnect with themselves, which can be done through the schedule of meditation and other techniques learnt during the course. The white, sandy beaches of Tulum surround you at the retreat as you practise yoga out in the fresh, open air. During the course, you will be given two free meals, both of which are healthy, vegetarian, European-style food, and your accommodation will be right on the beach. If this isnât already relaxing enough for you, the daily schedule also includes mind-refreshing meditation and massages. While this isnât a silent meditation retreat, there are periods of silence. Silent meditation is said to enhance oneâs awareness of inner self, and as such, Rolling Meadows encourages visitors to have âalone timeâ if they wish to do so. Quiet time also enhances the benefits you should achieve from the yoga you will be doing. 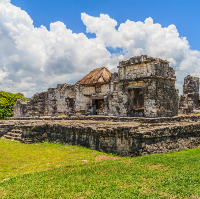 This retreat also encourages you to explore the surrounding area, such as visiting the ancient Mayan ruins. Tulum is famous for the ruins that are situated on top of the 12-metre high cliffs. This experience not only offers a chance to soak up ancient culture, but also affords unparalleled views of the ocean as you take a leisurely stroll through the ruins. From inner wellness and natural healing to something a bit different â body enhancement holidays. Medical tourism is thriving at the moment and the commercial money-maker in this industry is cosmetic surgery and procedures. Every year people are jetting off to beautiful places like Rio and Cape Town and coming back with more than a sun-kissed holiday glow. So what's it all about? To give you some insight on the subject and a few ideas, I'm going to take you through some of the key points and biggest destinations for body enhancements in the world today. How Popular Is This Trend? I'm willing to bet that everybody reading this knows of at least two people who've had some work done. The popularity of body enhancement procedures isn't limited to celebrities, public figures and CEOs â regular men and women are driving the demand for it. Body enhancement procedures don't only mean going under the knife, though. 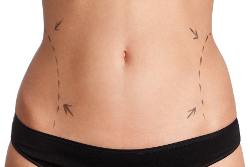 There are a range of less-invasive and non-surgical procedures that are less traumatic do produce results. Why Not Get It Done At Home? Despite being in high demand, body enhancement procedures don't come cheaply. In the UK, all strictly cosmetic treatments are not covered by the National Health Services, unless it's necessary to protect a person's well-being, like a rhinoplasty that will correct a breathing problem. Breast reductions would also fall into this category, in cases where the surgery can help with back pain. To give you an idea, the rough cost of a basic eye-brow lift is between Â£3,000 and Â£6,000 in the UK, depending on where you go, who your doctor is and how serious the lift is. The same procedure will cost Â£2,000 at the top end in Thailand, by an equally qualified surgeon at a posh medical centre, with added sunshine in December for good measure. This, in a nutshell, is how the 'body-enhancement holiday' was born. Another key reason for going abroad to have a procedure done is privacy. The last thing a person needs while they're recovering from a painful and invasive surgery, is to have their friends, family and in-laws ringing to come see how it looks. Or to know that everyone is talking about how bad âthe new noseâ is going to look. Cape Town's street cred in the medical world shot through the roof in December, 1967, when Chris Barnard performed the world's first heart transplant at Groote Schuur Hospital. Over the decades since then, the city has grown into one of the world leaders in medical tourism, for reasons that lie far outside cosmetic procedures. Medical Tourism International (www.medti.org) is an organisation that facilities the journey for people coming from outside the country to Cape Town for cardiac, orthopaedic, cancer and dental treatment, amongst others. In addition to this, it's home to a rolodex full of top-notch plastic surgeons and a wide selection of private medical facilities that offer everything from augmentation (ear pinning), to arm lifts, tummy tucks, buttock lifts and breast implants - all at a very affordable price, thanks to the favourable GBP to Rand exchange rate. The city is no eyesore, either, which doesn't hurt. 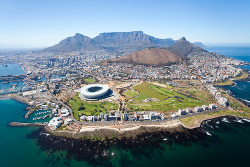 Botox, Perlane and Restylane treatment are a bargain in South Africaâs mother city. Itâs a non-surgical, low-impact procedure, which makes it convenient for travellers wanting to enjoy the city and get their face âdoneâ. It's not permanent - you'll be good from four to six months, but it does iron out your frown lines like a dream. A lesser known use for Botox is in treating patients who grind their teeth at night. Botox is injected into the jaw, where it relaxes the muscles and puts an end to the constant gnashing of teeth. The average Botox treatment in the UK is somewhere around Â£150 to Â£700 (at the very most) for a single treatment, while you can expect to pay about Â£100 for it in Cape Town. Perlane and Restylane (two hyaluronic acids used to make lips fuller and to flatten creases around the nose and mouth) treatment falls between Â£250 to Â£500 in the UK, while the rough price in Cape Town falls is in the Â£100 to Â£120 range. These procedures are carried out in the doctor's chair and take around half an hour to administer via injection. All things considered, Hungary is hands-down the best value-for-money option available to people in the UK. The standard of medical excellence versus the price of treatment, versus the distance you'd need to travel all makes for an incredible deal. The cost of crowns, root canal, bridges and dentures are a fraction of that in the UK, and the number of dental clinics around Budapest alone mean you won't have to wait months for an appointment. 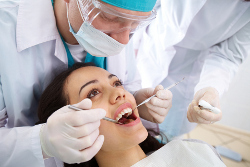 It might seem a bit lavish to fly 2 hours to visit the dentist, but it's totally worth it if you make a trip of it - as the title of this article says, it's body enhancement holidays. Like neighboring Thailand, Malaysia is fast becoming one of the worldâs premiere destinations for medical tourism. The Malaysia Healthcare Travel Council offers a comprehensive listing for its internationally accredited specialist hospitals, which service a yearly flow of foreign patients seeking good, affordable care in a range of areas, from cardiology to obstetrics and transplant surgery. Within the cosmetic field, one of the big sellers is the post-pregnancy package, which includes a breast augmentation or lift, as well as an abdominoplasty (or âtummy tuckâ as it is more commonly known). The goal is to restore the female body to its pre-pregnancy state. Together, these surgeries in the UK would cost roughly Â£10,000 and upward. Through a reputable medical tour agency for Malaysia, packages for both (including two weeks of accommodation, transfers, private hospital care and personal care) will set you back around Â£7,000. While these are two major procedures that do require some serious down-time during recovery period, a bit of pre-op shopping and sight-seeing is certainly not unheard of. Plastic surgery is an accepted norm in Brazil - it's even tax deductible. While the other countries on this list all cater for medical tourism as a whole, Brazil is very cosmetic-specific. The beaches in Rio are like a catalogue, displaying the work of its multitude of plastic surgeons who specialise in liposuction and implant procedures. 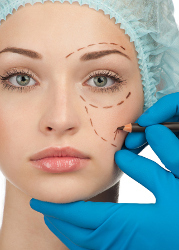 As far as plastic surgery tourist packages go, Brazil is one of the front runners of the world. Although there are a number of highly-affordable (in terms of surgery) packages that offer pre- and post-op treatment for these extreme procedures, you shouldn't base your choice on price. It's a far way to fly and a serious issue if you run into post-op complications after returning home - just speaking to someone on the phone in Rio can be a problem with the time difference. 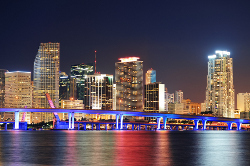 The more flashy option for implant and liposuction is Miami. Earmarked as one of the best-value travel destinations of 2013, the beautiful beaches seem like a great place to enhance your body. After the plastic surgery culture in Florida was both glamourised and villainised in the series Nip/Tuck, there's one thing everybody knows for sure: it's massive. This is quite funny, when you think about this southern state and the extremities of its population - people are either tanned and toned, or so obese that they need an electric buggy to move around in. Plastic surgery here is certainly a lot higher on the price scale; on average from Â£3000 to Â£6000, which is what you'd pay in the UK. Which is why many Americans opt for Costa Rica and Mexico for their cheap plastic surgery. But you'll get it done right in Miami, so long as you go to the right person - you should never get something done cheaply, in a city where the same thing can cost a fortune. I feel it's important to mention that I'm not a medical expert. There are serious risks that havenât been mentioned in this article - it's not to overlook or underplay them - I simply donât know enough to deliberate on the topic. Still, I donât think cosmetic surgery is wrong or right - just interesting. If you choose to have an enhancement procedure abroad, please do plenty of research and make sure that the doctor, facility and tour operator you use have official credentials, before you hand over a penny. And Medical Insurance is another factor that you will need to consider before heading off on a body enhancement holiday. While researching for this article, I found that just about every website offering cosmetic surgery packages has a Q&A section that tackles some of the harder questions people need to ask before undergoing something like this - for example, is plastic surgery the right option for you?